You get to work, review the orders you need to handle and doctor’s notes from the previous shift. You start to make your rounds when you hear the beep of a patient’s infusion pump signaling you need to hang a new bag of saline. You change course, replace the bag then get back to your rounds where you determine one of your patients is ready to go home. So you head back to the station and start to fill out discharge papers, then there’s that beeping again. Another change of a saline bag and you’re off to remove the catheter from the patient down the hall. That’s just the first hour of your shift, on a calm day. Sound familiar? 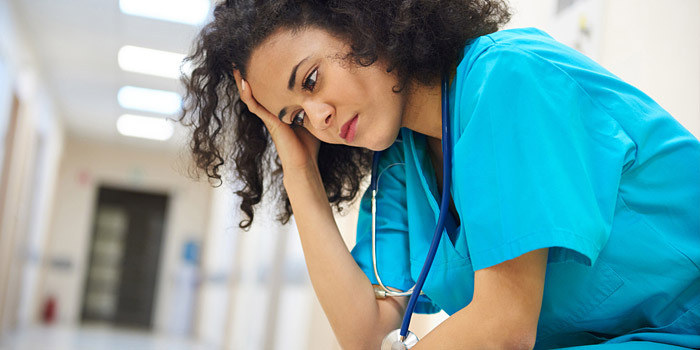 It’s no secret that nursing is a stressful career. Nurses have to deal with being perpetually short-staffed, learning new technologies, patients whose conditions may change quickly and demanding family members. Plus, there is the emotional labor that nurses, especially nurses who are women, carry. No wonder high rates of nurse stress and burn-out exist. While there is no way to get rid of stress entirely, there are better ways to handle it than others. The most important thing is to pay attention to your surroundings and your reactions, then control what you can and let go of what you can’t. Prolonged Stress or Pop-up Stress? One of the first steps to take is to identify what kind of stress you are feeling. Is it prolonged stress; a situation or a feeling that lasts for a long time? Or is it pop-up stress; something that comes up in one moment and then goes away? Prolonged work stress can be situations such as not feeling fulfilled professionally, a lack of advancement opportunities, low salary or conflicting or unclear expectations. While pop-up stress can be a patient’s condition worsening, conflict with a co-worker or merely a case of the “Mondays.” Knowing the type of pressure you are feeling can help you decide how to handle it. Another way to handle stress is having in place a few strategies that can help nip stress in the bud before it starts to overwhelm you. Next time you feel stressed at work, try one of these ideas. One of the most stressful moments can be having to see a patient when you don’t have all the information. If you’re busy, the rest of your team is likely busy too, but that’s when it is even more important to communicate. Talk to your manager about ideas to improve communication among your team and support an environment where everyone knows what they need to share and when. The perfect playlist can ease the pressure of any situation. Turning on some tunes before your shift or while you are on break can help chase away feelings of anxiety or edginess. Need some inspiration? Check out this playlist for nurses. Yes, stress eating can be unhealthy. That’s why keeping healthy snacks at your station or in the break room is key to dealing with stressful nursing shifts. Having mixed nuts, broccoli, whole grain English muffins with jam or honey or green tea around can minimize the impact of stress munching. Have a sweet tooth? Try some dark chocolate or sorbet! When your day seems at the height of chaos, bring it back into focus with your own mantra. A mantra can be a word or a movement – what counts is repetition. Find something that embodies how you want to feel: calm, in control, confident, whatever it is, make it your own. Focus on your mantra as a way to block out negative thoughts and stay motivated. Tensions can run high with nurse colleagues, patients or families. In those times, the adage of laughter is the best medicine can do wonders. Using humor to diffuse a situation or ease the stress of the moment is a great strategy to keep in mind. Next time you need a laugh, try out one of these jokes for nurses. During a busy shift, it might feel like you don’t even have time to go to the bathroom let alone take a full break. In those moments, remember to breathe. Simple and quick meditations can revive your calm and get you ready for the next challenge. Try inhaling for three seconds, holding your breath for just a moment, then exhaling through your nose for another three seconds. Most of the time a sense of stress has to do with loss of control. By making a plan at the start and end of your day, you’ll minimize the chance of surprises throwing off your schedule. When you start your shift, get organized and look at your full list of orders. Try to anticipate any questions you might have or resources you might need. Then at the end of the day take 10 minutes to get ready for your next shift. These short planning sessions will help set you up for success! When you end your shift, remember there are ways you can de-stress after your shift as well!